Vancouver’s once-steamy housing market has hit a cold snap. Home sales in the Greater Vancouver area fell 14.3% last month from a year earlier,according to the Real Estate Board of Greater Vancouver. January’s total of 1,351 sales was the second-lowest showing for that month since 2001, the realtors’ association said. 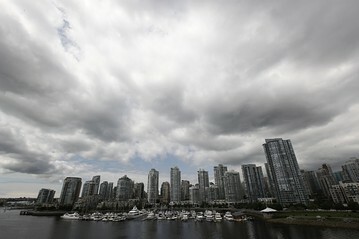 January was the tenth straight month that Vancouver, Canada’s third-largest city, saw year-over-year sales declines. Prices were also lower. The board said the benchmark price for a home in the city was at 588,100 Canadian dollars ($589,396), down 2.8% from last year. The cool-down is due to several factors, said Eugen Klein, president of the association. The market continues to feel the effects of last year’s tightening of mortgage rules by the federal government, which pushed some first-time buyers out of the market, Mr. Klein told Canada Real Time. He said the association has seen a recent decrease in activity by foreign buyers, who contributed to the city’s hot housing market in previous years. As prices and sales go down, so too have listings, with many sellers opting to take their home off the market rather than settling for a price that they don’t want, Mr. Klein said. Listings were down 4.5% in January from December– the fourth consecutive month that overall home listings declined. Still, with the Bank of Canada unlikely to raise interest rates in the near term and job creation in British Columbia still running at a healthy pace, Mr. Klein is still optimistic about a pickup in the Vancouver market.